October | 2009 | NICE! Project X – take Shaun White and a huge backcountry half pipe with foam pit, film Shaun going off the charts, put results online! Currently in teaser format but with loads of videos, photos, and snippets of info. Apparently Shaun has really pushed the boundaries of progressive pipe riding in this project – so looking forward to seeing the results. Videos are really cool, also giving behind the scenes footage of how they created it all. Nicely designed too, with each section having parallax animation giving a senstation of depth. 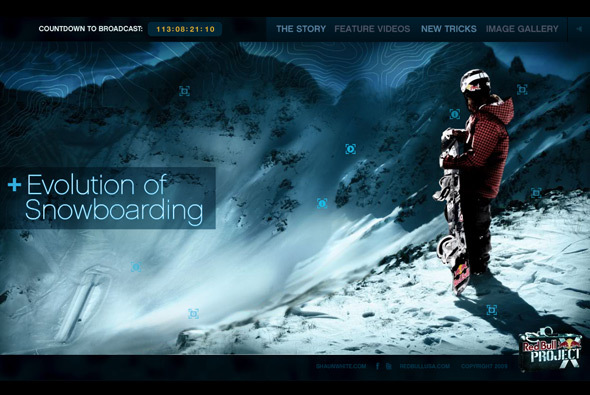 Nice transitions and rollovers and so on, all in all a pretty cool site. House of Orange – Model agency / hair, makeup, and styling agency / photography agency. 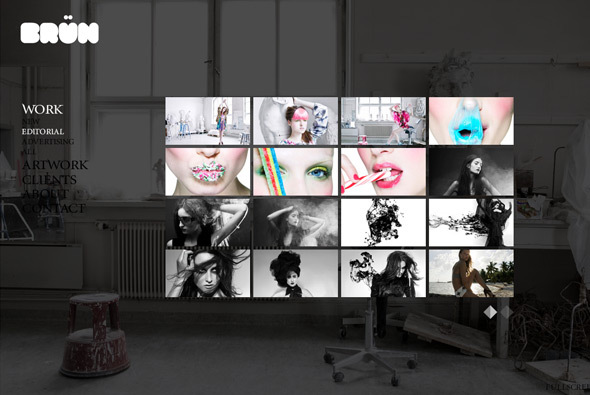 Nice, simple and effective portfolio of their talent. Really like the way the images build up in different sizes and with a random selection shown each time. Cool transitions with contrast burns and so on. Portfolio of Norweigan photographer Thomas Brun. Standard but well considered, simple portfolio site with nice animations and the functionality you come to expect from such sites – zoom in, fullscreen and so on. Nicely designed with several clever touches, straight to the point. The Puma Index, very simple and fun, promoting Puma’s body wear. Linked to the stock exchanges, DOW for USA, DAX for Germany, and ASX for Australia, with each market a different male or female model. The premise is when the stock market goes down the models on show more of the Puma body wear, i.e. they take more clothes off. When the stock market is doing well they wear winter clothes and so on. Really fun and simple, with lots of clever touches, for example, the videos loop and occasionally crop to give the impression there is a lot more footage. They have managed to keep the design so clean and simple, love the touches on the icons and buttons. Overall a really nice site, very clever and nice way to see a range of Puma products, with loads of options to embed, download iPhone app, and so on. 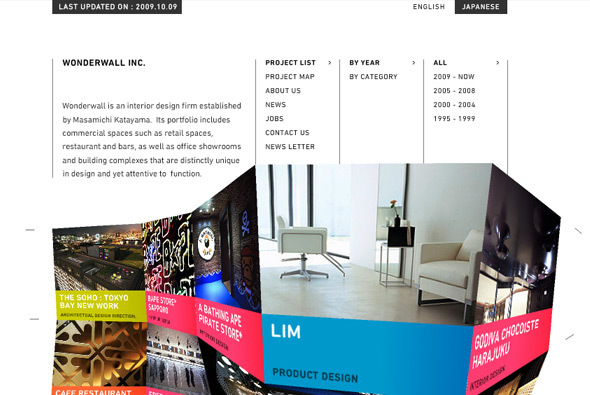 Interesting site of Japanese interior design firm, Wonderwall, formed by Masamichi Katayama. Set around an amorphous wall of projects, quite literally a wonder wall, when you rollover the wall it morphs size and position dependant on mouse location. It really is the centre piece of the site, and is really fun to play with. A similar mechanism forms the way you go through photos for each project. Nicely designed, very crisp, but with a fun twist. 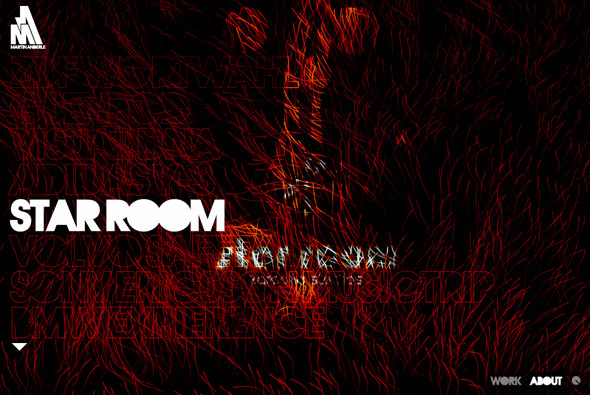 Created by one of my favourites Yugo P.
Portfolio of interactive designer / developer Martin Anderle. Pretty simple, with some nice touches and animation – I like the particles moving around the screen – they form colour and shape on rollover of the individual project thumbnails. It looks great and provides a fantastic moving montage of colour and shape. Promotional site of Adidas’ Y3 Fall/Winter collection 2009. Styled in the form of satellite imagery, you can browse the various styles from a top down perspective, clicking on one gives you a video of the style rotating 360 degress. With highlights from the ‘look’ being displayed – also allowing you to zoom in and so on. Love the style and the transitions – heavily pixellated sometimes with distortion, nicely done. Lots of cool transitions and the usual flair from Adidas / Sid Lee. Portfolio site of photographer Marija Ivkovic. Created in quite a unique way – you navigate the photos by rolling over the various strips of grey, each representing a project. The longer the strip the more images in that project – when rolled over the contents are revealed, by simply leaving your mouse towards the bottom you navigate through the sets, there is a zoom function also. Nicely animated with some great photos in there – pretty cool stuff. A set of interactive music videos for French singer Emilie Simon. Very similar to the Arcade Fire interactive video which was also shot by the same director – Vincent Morriset. Each video has some simple interactivity which changes your experience of the music video, for example, in the Rocket to the Moon video you can change the playback of the video by clicking on the clock in the video, in the Chinatown video by clicking around coloured smoke goes in the direction of your cursor.